Yūgen is Blain|Southern’s first exhibition by artist Bosco Sodi, and takes its title from a multi-layered Japanese concept, describing the evocation of inexplicably deep emotions in response to aesthetic creation, which extends to a sense of awareness and acceptance of impermanence. Sodi’s new work features rock sculptures ranging in size, and large-scale impasto paintings made with layers of pure pigment, water, glue and natural fibres. The artist uses raw material in crude form, Sodi’s work is transformative; the artist evokes the aesthetic of form, highlighting its natural elements and drawing on wabi-sabi, the Japanese aesthetic philosophy, a worldview centered on the acceptance of transience and aesthetic imperfection. Image: Bosco Sodi, Yūgen, installation detail, 2016. Photo: P A Black © 2016. Sodi’s practice is quite physical in nature; via the artist’s choice of material and context. The artist extracts the rocks from the Ceboruco volcano in Mexico. The material is in fact dried volcanic magma, transforming material from recent geological formations. The formality of material is Sodi’s primary concern, firing the rocks at extremely high temperatures; the artist’s practice reflects the history of the material. 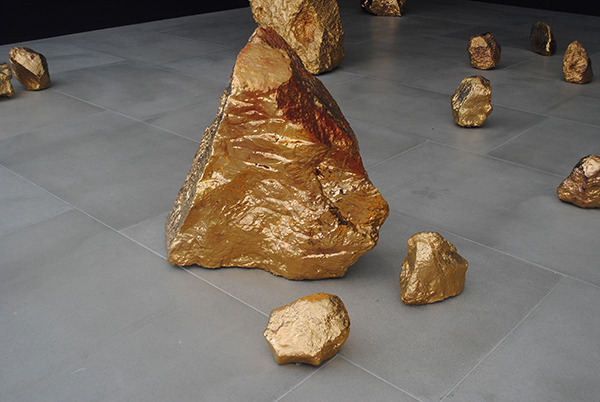 Sodi encases the rock in gold ceramic glaze, and in doing so the work becomes a signifier of geological time as opposed to the fragility and impermanence of the human condition. The work is displayed in installational form reminiscent of a Japanese Karesansui garden. The aesthetic is contemplative, beauty is evocative, yet the recontextualisation is extreme. A journey from volcano to gallery, the transposition highlights the viewer’s perception of value and antiquity. The artist’s practise attempts to return a strong sense of aesthetic value to contemporary art, eschewing grand conceptual pronouncements. But Sodi’s practice highlights conceptual concerns; the artist has studios in Puerto Escondido, Mexico, Barcelona, Spain and Brooklyn, New York, creating works that form as a response to each location, highlighting natural process and the origins of the material. Sodi exposes his work to atmospheric factors, with the resulting texture and form of the rock affected by precipitation, heat and humidity. 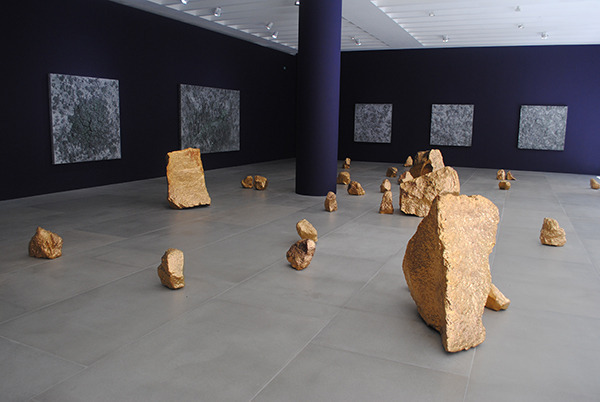 Image: Bosco Sodi, Yūgen, installation view, 2016. Photo: P A Black © 2016. The nature of the artist’s practice highlights the narrative of materials. Sodi has extracted his forms from nature, material formed by ongoing geological processes, via pressure, time, and ‘violence’. The artist continues the evolution of the material via intervention, and by allowing natural processes to continue to affect the work. The transformation of the material into art is in fact temporary. The exhibition of the work is merely a pause in the narrative journey of the object. The material will continue to change due to environmental factors, no matter how small, until eventually it will return to the earth and greater geological processes. Geological time spans will regain purchase over the artist’s objects and materials. This pause in the narrative journey of Sodi’s materials and objects is akin to the anthropic principle in science, whereupon the pause allows the material a dialogue concerning its own aesthetics – having been recontextualised by the artist’s intervention and the gallery’s environment – before the material ceases to be a dialogue concerning aesthetics and returns to merely having a natural aesthetic. Sodi is an alchemist of aesthetic beauty turning volcanic rock into gold.